Bali Kintamani: The Bali was as-expected, a nice floral aroma, though not terribly sweet. As I mentioned in my first post on the bean my roast was extremely light, which contributed to a strong “jute” taste, which really shone through in the cupping process. Not something you want to shine through… Letting the roast go for another 20 seconds should really help this coffee blossom. Brazil Cerrado (light): The Brazil Cerrado light roast was a very subtle nutty flavor. As a cupping coffee it was decent, but at this light roast its flavors would make an incredible espresso. 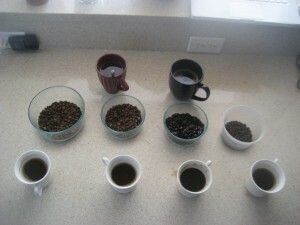 Ethiopa Yirga Cheffe: The Ethiopian coffee definitely won this home cupping competition. With an incredibly light, but powerful sweet, fruity taste, this coffee makes you want to pour a small cup to slowly bask in while forgetting about the world around you. Bonus: The one weird “roast” we tried was the Ethiopian with a touch of salt ground in. While the salt smoothed the coffee out (removing all bitterness), it also dulled the sweetness. I think there might be a level at which salt could help the coffee (perhaps a grain? ), but our experiment was a failed one. did you know that ‘cupping’ also refers to an ancient chinese medical practice?